Which Tudor royal, or royals, do you most associate with Ludlow Castle? If you are anything like me, the first people that come to mind are the young Arthur, Prince of Wales, and his new bride, Katherine of Aragon, who set up their princely household at Ludlow Castle in January 1502. However, in preparation for a new documentary which I am involved in filming next month, I am being challenged to revisit a place that my co-author, Natalie Grueninger, and I first wrote about in In the Footsteps of the Six Wives of Henry VIII. This time, I need to see it through a slightly different lens; the year is 1525, and the Princess Mary sets off from London to take up her position as head of ‘The Council of the Marches’, based at Ludlow Castle. So, why not come with me as I return to Ludlow Castle? History has come full circle and Katherine’s 9-year-old daughter, now herself the heir to the Tudor throne, is staying at Ludlow as part of a nineteen month ‘tour’ as England’s Princess of Wales. In this post, we will hear a little of the early history of the castle; how it became a ‘training ground’ for kingship, the regal accommodation that housed Mary during her stay at Ludlow, and the often misunderstood / misquoted itinerary of the 9-year-old Tudor princess, who spent much less time at Ludlow than many historians have previously stated! 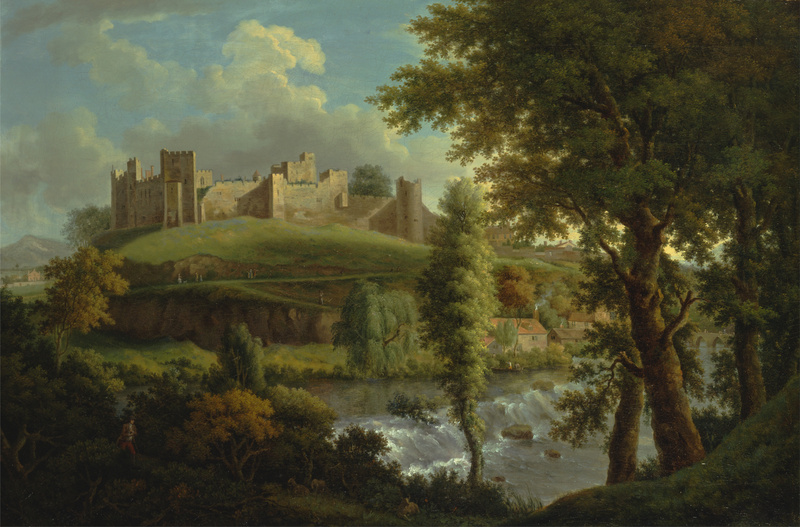 Ludlow Castle was built by the de Lacy family shortly after the conquest. Perched on a rocky promontory, overlooking the River Teme, it is an imposing structure and is described by the eminent architectural historian, Antony Emery, as ‘arguably one of the finest Edwardian residences in England – and by ‘Edwardian’, he means Edward I! However, the castle was to truly reach its zenith under the ownership of the power-hungry Roger Mortimer who, having affiliated himself with the estranged wife of Edward II, Isabella of France, essentially seized power in England and became king in all but name. Ludlow was the epicentre of his power-base during that period and Mortimer held court at Ludlow. It became ‘a semi-royal centre with much feasting, entertaining, and a procession of friends and guests’. As a wealthy magnate, Mortimer was responsible for adding to the existing great hall and lower chamber block at the castle; he commissioned the construction of an extensive and palatial second residential (or ‘Upper’) chamber block, as well as the Chapel of St Peter. We will learn more about these apartments in a moment, but suffice to say at this stage that, according to Emery, the result was to create a ‘magnificent group of buildings’, which were an ‘outstanding example of [their] time’ and that ‘its only peer [was] the great hall, service and residential range added at Kenilworth Castle at the close of the fourteenth century’. In the fifteenth century, as Earl of March, a young Edward Plantagenet inherited the property from his father, and so on his accession to the throne as Edward IV in 1461, Ludlow Castle became the property of the Crown. When Edward sent his own sons to live there, away from the foul air and machinations of London, a precedent was set. For three generations Ludlow Castle was to become the principal seat of first, ‘The Prince’s Council’, then later ‘The Council of the Marches’, through which the Prince, and / or Princess of Wales, presided over their own mini-court and kingdom; a sort of training ground for princes! Inside the Inner Bailey at Ludlow Castle, facing the Great Hall (centre) and the Solar Block (left), where Mary may well have stayed during her brief sojourn to the castle in 1526. Just showing on the right is the Upper Chamber Block built by Roger Mortimer (see also image below). Accordingly, Prince Arthur, eldest son of Henry VII, resided at Ludlow with his council from the age of seven. He returned to govern the Marches as Prince of Wales with his new bride, Katherine of Aragon, in January 1502. Of course, their joy and triumph was short-lived when Arthur died on Saturday 2 April in the same year, only months after their marriage. Goodness only knows what Katherine was thinking and feeling as her entourage eventually left Ludlow and she wound her way back to London and an uncertain future! I suspect she wouldn’t have dreamt that 24 years later, her own 9-year-old daughter by her first husband’s younger brother, would be following in her footsteps and holding her own court at Ludlow Castle as Princess of Wales! Any royal party arriving at Ludlow Castle would have had to make its way gradually uphill through the town, across the bustling market place, no doubt thronged with curious onlookers, and then on under the twelfth century gatehouse. This formed the principal entrance to the castle, as it does today, allowing access to the vast, outer bailey. Occupying an area of almost four acres, and surrounded by the castle’s curtain wall, this huge space housed stables, storehouses and workshops. As usual, the inner bailey contained the privy apartments at the castle. It was reached by passing from the outer bailey, through an arched entrance, which was next to the original, Norman keep. Once through this second gateway, the residential lodgings were directly opposite, built along the curved, curtain wall. Begun in the late thirteenth, and completed in the fourteenth, century these high-status buildings were palace-like in their magnificence and comprised a series of interconnected buildings. From left to right these included; a three-storey solar block which extended into the northwest Norman tower; an adjoining Closet Tower; in the centre, a magnificent great hall, which in 1684 was said to be ‘very fair’ and, to the right, another three-storey residential block, sometimes referred to as ‘The Great Chamber Block, or Upper Chamber Block’. The principal rooms used by the most high-status resident were on the upper storey of the Solar Block, accessed directly from the adjacent great hall by a spiral staircase, or, by a staircase on the ground floor. Prince Arthur had occupied these lodgings during his sojourn at the castle and we might surmise that Princess Mary did the same. Perhaps Mary had heard tales of her mother’s time in Ludlow from Katherine herself, or from her governess, Margaret, Countess of Salisbury (who had also accompanied the 15-year Katherine to Ludlow in 1502), and one wonders how she felt about being at the place where her beloved mother had experienced such elation, as well as such sadness. Today, the apartments are an empty shell; the roofs and floors are gone, although they did survive into the nineteenth century. The exposed stone walls, some covered in moss and lichen, look bleak, and it is hard to see how Ludlow Castle could be viewed as palatial. However, it most certainly was in its day; the configuration of rooms into private suites heralded the latest in residential fashion for the aristocracy of the medieval period. And so, today’s time-traveller must reimagine its splendour; the walls plastered, covered in the rich hues of finely carved, oak panelling, with expensive tapestries hung thereabouts, the chambers warmed, and brought to life, by the flames dancing in the hearths of the many open fireplaces. In 1525, final preparations were being made for Princess Mary to take up her position as titular head of a new ‘Council of the Marches’; a position last formally held by her long dead uncle, Arthur. The orders of Henry VIII stated that ‘the good order quiet and tranquilitie of the Countreyes thereabout hath greatlie bene alterd and subverted’ by the absence of royal authority. A new council was required to reassert royal power in the region. Mary was now 9 years old; as Henry VIII’s only surviving heir, she was now old enough, it seems, to begin her grooming for kingship; she would gain valuable experience of how to conduct herself during ceremonial occasions. Thus Mary, the king’s ‘deerest most beloved onely doughter’, would go to Ludlow with a council and hold court there. But what of Mary Tudor’s sojourn at Ludlow? According to Princess Mary’s Itinerary in the Marches of Wales 1525-1527: a Provisional Record by W.R.B Robinson, many historians have inaccurately surmised that much of the Princess Mary’s itinerary, after she left court to take up residence in the Marches, was actually spent at Ludlow. Robinson points out that this summation is largely based on a lack of scrutiny of contemporary records, in particular the Journal of Prior More of Worcester and a mis-dating of certain letters included in The Letters and Papers of Henry VIII. This re-evaluation of the documents leaves us with a much more complete (although there are still gaps in the records), and accurate, itinerary in which we see the princess effectively go on a greatly extended progress. So what do we know of this itinerary? Well, having taken leave of Wolsey at his house of The More, in Hertfordshire, on 12 August 1525, the royal party moved to Tewkesbury via Wooburn (Woburn), Reading Abbey, Malmesbury Abbey, Kingswood Abbey, Thornbury Castle and Gloucester. Mary seems to have effectively based herself at Tewkesbury between September and the following January, (notwithstanding the occasional trip to Worcester), where she was lodged in a manor in the park belonging to the abbey. Probably just after Twelfth Night (6 January) 1526, the princess finally moved on from Tewkesbury, relocating to Worcester and the surrounding area (as a guest of Prior More) until mid-April, when she travelled to Hartlebury, some 25 miles to the east of Ludlow. The princess eventually arrived in Ludlow in early May. However, we should be clear that the evidence for Mary’s presence there is indirect, and comes via two letters sent by John Veysey, President of Mary’s Council and Bishop of Exeter. These letters were dispatched to Lord Ferrers at Westminster, with instructions to show them to the king and Wolsey. The latter had largely overseen the assimilation of the Princess’ Council. The first of these letters, dated 3 May, concerns the potential jeopardy facing Mary. There were concerns for her life as the plague had broken out in ‘ dyvers townes and palces yn thes partes’. Veysey goes on to state his dilemma that ‘if any suche ynfeccion [infection] should fortune to be at Hartalbury [Hartlebury] [we] have not hereabout any place convenyent wherunto the princes grace may remove to.’, (i.e. if plague broke out at the nearby manor of Hartlebury, they were scuppered(! ), with nowhere safe to retreat that was both away from the crowds and suitable to house a royal princess). There is no direct evidence that Mary was there; therefore the conclusion is by inference and it is two-fold. Firstly, in this letter, Margaret Pole, Countess of Salisbury, Mary’s ‘lady governess’ is specifically mentioned as being present at the castle. The reasonable hypothesis, therefore, is that Mary’s governess was unlikely to be anywhere other than at the princess’ side. Secondly, one of the concerns was that those councillors who had been in contact with ‘suitors’ (‘suitors’ meaning people travelling from the surrounding areas to pay homage to Mary, or to petition the young princess) should be kept away from the princess for fear of passing on any infection. As the council was also at Ludlow Castle at the time, this would seem to be an odd request if Mary was already safely housed elsewhere. The desire was to protect the precious Tudor heir to the throne at all costs. Orders were promptly dispatched from London, via Wolsey, to remove Mary ‘to be logid aparte in sum convenient place, standing in clene aier with a [convenient?] nombr about her’. This duly ensued, ‘with her noble grace beyng withdrawen with privy company in a place solitary, bycause of the deth [plague] for introduction of the French tongue’. Where this ‘place solitary’ was is unknown, but the Tudor Princess remained lodged there through part of May and into June. But how would Mary have spent her time at the castle? Clearly, she was expected to participate in certain ceremonies; such participation would teach Mary what was expected of her royal role. Outside of this, her religion and studies must have taken up much of her time. She had, of course, been brought up steeped in her Catholic faith, and was as devoted to her religious practice as her mother. It is likely that the princess tended to her devotions daily. When not in the chapel, she was most likely with her tutors or spending time with her female companions, learning the pursuits befitting a royal lady, such as sewing, reading, dancing and playing musical instruments. On Sundays and Holy Days, prayers and services were held in the Norman chapel of St Mary Magdalene, situated in the inner bailey; it is hard to imagine Mary being absent during these occasions. Interestingly, after this point in Mary’s story, contemporary documents suggest that she began to wend her way back through Worcestershire and Oxfordshire to meet up with the king and queen at the Old Palace of Langley, a satellite hunting lodge of nearby Woodstock Palace. Mary spent a month at court with her parents on progress, visiting such places as Stony Stratford and Ampthill. Afterwards, they parted once more, with the princess heading back out towards Worcestershire, where she spent Christmas and the following two months at Bewdley, most likely at the Tudor mansion called Tickenhill House. By late February 1527, Mary had arrived back in London. She had been recalled by the king so that she could be presented to the French Ambassadors, there to negotiate her betrothal to Francis I. However, the political climate was changing quickly – and not to Mary’s advantage. When the princess set out for Ludlow in the summer of 1525, she could not have seen how her world was about to be rent apart by ‘The King’s Great Matter’. Yet, when she returned it is likely that her father was already head over heels in love with Anne Boleyn; most historians date the beginning of this romance to 1526/27. In the quest for a legitimate son, Mary’s own legitimacy would soon come into question. By early 1528, the council was disbanded permanently; never again would Mary preside as Princess of Wales over father’s dominions in the Marches. If you wish to find out more about the 1525-1527 ‘progress’ of the Princess Mary, you can access the list of known properties visited by the 9-year-old Mary Tudor in The Tudor Travel Guide’s library. This FREE resource section is available to The Tudor Travel Guide Community by subscribing to the blog. Just fill in your details below to get instant access for the lifetime of this blog! If you want to read more about the life of Mary I, visit our friends over at The Tudor Times. Note of Gratitude: My thanks go to my co-author, Natalie Grueninger, who wrote the original entry for Ludlow Castle in In the Footsteps of the Six Wives of Henry VIII, and some of whose facts and words I have used in the writing of this blog. A very interesting article. I have visited Ludlow several times but didn’t know about the connection to Mary.